CARRIE FISHER’S LATEST OFFERING, the cleverly titled Shockaholic, is a markedly similar follow-up to her Wishful Drinking, which was released in 2008 and eventually parlayed into a successful one-woman show on Broadway. For those who are partial to Fisher’s sharp and acerbic take on things, her sense of the absurd clearly derived from first-hand experience, Shockaholic (if not exactly shocking) doesn’t disappoint. In typical Fisher fashion, she finds humor in the madness: ”One could argue that by having regular ECT treatments, I’m paying two – that’s right, two – electric bills. One for the house and one for my head.” But on a more serious note, she adds that it “punched the dark lights” out of her depression. The best piece is tagged “The Senator,” about a decades-old dinner engagement that Fisher shared with her date (and later lover), Connecticut lawmaker Chris Dodd, and that icon of American politics, Ted Kennedy. Colorful and well-written (she alludes to Kennedy’s “alert and aristocratic eyes”), she describes a memorable evening that turned into a bit of a showdown, triggered by the senator’s more than subtly salacious and unexpectedly inappropriate questions after having a bit too much to drink. Another great Fisher line, one amongst many in this short but lively compilation that displays much of her characteristically biting wit. WITH WIMBLEDON, that most venerated of competitions now in full swing at London’s All-England Club, those with a love for literature as well as tennis can feast on a compilation that combines some of the most magnificent writing on the subject from one of the greatest writers of his generation. 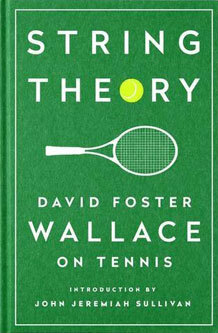 String Theory: David Foster Wallace on Tennis by David Foster Wallace is important enough that the Library of America recently published it as a special edition, which in physical form looks and feels like a classic textbook – appropriate, as there’s so much to learn within its pages. David Foster Wallace (who left us far too early, at the age of 46 in 2008) was best known for his novel, Infinite Jest, which sparked an uproar when it failed to be nominated for the Pulitzer Prize for fiction in 1996. It was a tour-de-force opus (1,100 pages long) that cemented his reputation as a fresh and consummately creative voice in the literary stratosphere. In wickedly incisive form, he writes that “This is for me, the real mystery – whether such a person is an idiot or a mystic or both and/or neither. The only certainty seems to be that such a person does not produce a very good prose memoir.” Elsewhere, he describes the brash and grungy Andres Agassi — “whom I loathe with a passion” – as “amazingly devoid of finesse, with movements that look more like a Heavy Metal musician’s than an athlete’s.” Ouch! 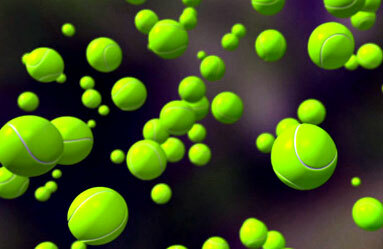 There’s also his intelligence, his occult anticipation, his court sense, his ability to read and manipulate opponents, to mix spins and speeds, to misdirect and disguise, to use tactical foresight and peripheral vision and kinesthetic range instead of just rote pace — all this has exposed the limits, and possibilities, of men’s tennis as it’s now played. FANS OF CARLY SIMON are probably over the moon that the quintessential ‘70s singer/songwriter has finally gotten around to penning her long-awaited autobiography, about a third of which lays bare her marriage to another rock legend, James Taylor, in vivid detail. Along the way in this intensely self-searching, if sometimes overwrought, memoir are plenty of scintillating tidbits about other celebrated male figures who intersected with her life — Mick Jagger, Warren Beatty, Cat Stevens, and Sean Connery among them. It’s Beatty who’s at last identified as the mysterious subject of her biggest hit, “You’re So Vain,” though Simon claims the actor only figures in the second verse, which memorably begins, “You had me several years ago, when I was still quite naïve…” Why she continues the hide-and-seek game about the identities of the other two men who inspired the song is baffling at this point. After more than 40 years, does anyone still care? The chapters about her childhood are by far the most intriguing in the book, a psychodrama played out amidst a mother who was carrying on an affair with a boy 20 years her junior within the very confines of the Simon home, and the elegant and enigmatic father whose attention Simon longed for in the thick of the dysfunctionality. The emotional turmoil resulted in a psychosomatic stammer that would evolve into the paralyzing stage fright that plagued her in later years. Simon’s first success as a single, the emblematic ‘70s ballad, “That’s the Way I Always Heard it Should Be,” was a bit of a feminist anthem at the time, capturing the ambivalence of women dealing with societal mores that dictated marriage as the ultimate accomplishment. The song’s last line, “We’ll marry,” is rendered, not with joyous exultation, but with a weary resignation. To say that Taylor was the love of Simon’s life is well beyond understatement. “James was my muse, my Orpheus, my sleeping darling, my ‘good night, sweet prince’, my something-in-the-way-he-moves,” she writes about him at the beginning of the relationship. Addiction, touring, and the inevitable temptations of the road eventually took their toll on the marriage, though Simon writes about the troubadour in (mostly) hagiographic terms, and to this day lives in the same “shack” on a 40-acre expanse on Martha’s Vineyard that she helped build with him the ‘70s. Eleven years and two children – Sally and Ben – later, she and Taylor finally divorced in 1983. Which is just around where the book ends, as well. And which is puzzling, considering the mileposts that still lay in store for Simon well beyond the mid-‘80s. Another marriage for one: there’s no mention of James Hart, a writer and businessman who not only shared a first name with Taylor, but also an uncanny physical resemblance, and to whom Simon was later married to for 20 years. In 1988, she won the Academy Award for “Let the River Run,” from the film Working Girl, which was followed by a Grammy in 1990. Several more successful albums, children’s books, an opera (Romulus Hunt), and a bout with cancer in 1998 remain topics for another time. 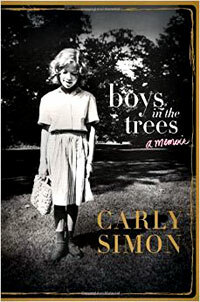 In the epilogue to Boys in the Trees (the title is from an album released in 1978), Simon writes that she “doesn’t wait for Orpheus to come anymore,” and it should be noted that she and Taylor have maintained a chilly distance for decades. Clearly, though, it’s a relationship that still haunts and seems to define her all the way to the present, rather unnecessarily to those looking from the outside, especially in light of her own unique persona in the annals of pop music apart from Taylor. Then again — as she sang on another one of her hits, “Jesse” — the heart has a will of its own. Stillness is the only thing in this world that has no form. But then, it is not really a thing, and it is not of this world. Those familiar with the writings of Eckhart Tolle have often referred to the transformative effect of his dual bestsellers, The Power of Now and A New Earth. Consider me a convert. Having read more than my share of books devoted to the journey of self-discovery (often convoluted offerings that may inspire initially but whose impact soon dissipates once you’ve finished reading them), both Power of Now and New Earth are works you actually return to – over and over – as boosters to a philosophy that is both amazing in its simplicity, as well as its depth. I recently learned of the Tolle books, first published in 1999 and 2005 respectively, thanks to my “Irish-twin” brother (we’re less than a year apart), not expecting the profound effect that they would have on my approach to life and insights into areas that previously defied answers. I realized there was something very different going on here, as I encountered paragraphs that would stop me in my tracks, demanding to be pondered, asking questions that I never realized lay just beneath the surface. Tolle’s belief is that everything converges in the moment, in the Now, and that understanding this lies at the core of “consciousness,” and more specifically the “presence” that is necessary to free oneself of old hurts (what he calls the “pain-body”) as well as those obsessions about the future that keep us from realizing our truest potential. I’d venture to say Tolle’s discussions of the ever-hungry pain-body, which feeds on destructive emotion – anger, resentment, regret — are infinitely more perceptive than years of therapy. It is the pesky mind — with its intrusive thoughts and rigid form structures that make-up what Tolle terms our “egoic” selves — which requires constant vigilance if one is to forge a path towards the ultimate goal of inner nonresistance. There’s an absolutely wonderful anecdote about how Tolle was once sitting in a park watching ducks on a lake when a fight broke out between two of the creatures (territorial encroachment or what not). When it was (quickly) over, they both vigorously flapped their wings, as if to shake off any remaining negative energy, then serenely glided off in separate directions as if nothing had happened. 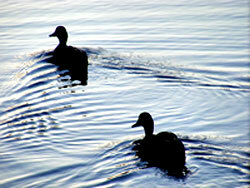 “If the duck had a human mind, it would keep the fight alive by thinking, by story-making,” Tolle writes. “This would probably be the duck’s story: ‘I don’t believe what he just did. He came to within five inches of me. He thinks he owns this pond. He has no consideration for my private space. I’ll never trust him again. Next time he’ll try something else just to annoy me. I’m sure he’s plotting something already…’ And on and on the mind spins its tales, still thinking and talking about it days, months, or years later. It’s a powerful example taken from nature, which Tolle often alludes to as a guidepost to understanding the Now in action, and the quiet force of stillness in all its manifestations. Time to heed those ducks. Of course, Isaac’s Storm told of a very different kind of disaster. The sinking of the Lusitania on May 7, 1915, and the loss of its 1,198 passengers and crew, came just a handful of years after the Titanic tragedy. At the time, the fastest civilian vessel to be found on the high seas, the British-branded Lusitania, pride and glory of the Cunard line, was sailing in treacherous waters. World War I had begun, Germany was at war with Great Britain, and traffic across Atlantic shipping lanes was fair game for enemy submarines with torpedoes at the ready. At the same time, the U.S. under President Woodrow Wilson had assumed a neutral stance in the conflict. And in one of those Larson touches that brings the dry subject of history to life, he presents us with a side of Wilson, then at a personal crossroads after the death of his wife, that is both affecting and haunting. His story is woven amidst the dangerous world circumstances that would lead to America’s inevitable involvement in WWI. Unfortunately for Turner, he had a relentless and faceless adversary in the form of Walther Schwieger, German commander of the U-20 submarine that would soon bring about the Lusitania’s demise. Larson details all one needs to know — and more — about the inner workings of a vessel stealthily stalking prey from hundreds of feet under the sea, guided by a ruthless lieutenant who measured success only in terms of tonnage that he could bring under. When the time came, Schwieger needed only one torpedo to slay the mighty Lusitania. She sank in just 18 minutes, 11 miles off the coast of southern Ireland. 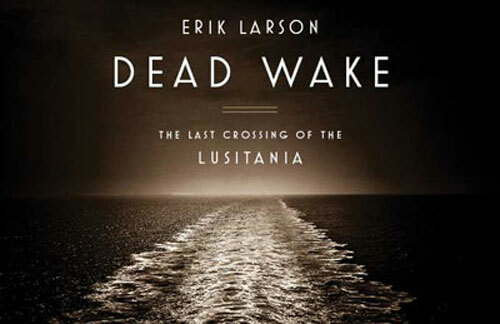 Not surprisingly, it’s the human stories, not the political machinations, technical details, or complicated spy codes, that linger after reading Dead Wake. Stories like that of the passenger Theodate Pope, an architect and spiritualist with deep forebodings about the voyage, left for dead after the recovery effort, only to be found alive by a fellow passenger. And then there’s Charles Lauriat, the bookseller who lost a fortune in priceless works by Thackeray and Dickens in the destruction, but was able to survive the sinking. And the woman who left a baby in the hands of a steward as she made her way to collect another of her children, never to see the infant again. And of course, there are the curious twists of fate that always seem to surround great tragedies. Alfred Vanderbilt, of the American railroad and shipping fortune, had cancelled passage at the last minute on the Titanic three years earlier. But he pushed his luck when he booked on the Lusitania, where, Larson writes, Vanderbilt received an ominous telegram soon after boarding that read: “The Lusitania is doomed. Do not sail on her.” It was signed “Mort,” as in French for death. Vanderbilt wrote it off as “Probably somebody trying to have a little fun at my expense.” His body was never recovered. Coincidence, however, did not play a part in the ultimate fates of the captains of the Titanic and the Lusitania. Unlike his colleague, Edward J. Smith, whose gallantry in going down with the Titanic became the stuff of legend, William Turner not only survived the sinking of the Lusitania, but also another incident of a torpedo attack on one of his ships a couple of years later, which resulted in the loss of 153 soldiers and crew. Turner lived an improbably long life, weighed down heavily by the memories of a tragedy, which fairly or unfairly, he was often accused of allowing to happen. His only words on the matter consisted of, “I grieve for all the poor innocent people that lost their lives and for those that are left to mourn their dear ones lost.” One hundred years later, those souls are remembered in an impeccably researched book that brings one of history’s most famous maritime disasters remarkably to life. Then I thought of the number of Baby Boomers now struggling for answers as they deal with aging and incapacitated parents, looking for pathways to follow as they wrestle with an issue deeply affecting their own lives, and it’s no wonder Being Mortal strikes such a major chord. Atul Gawande, a surgeon at Brigham and Women’s Hospital in Boston who’s also a staff writer at The New Yorker and author of three books – one of which, Complications, was a finalist for the National Book Award – sets about the task of exploring the great dichotomy of how modern medicine, in its effort to extend lives, is often oblivious to the wide-ranging ramifications that impact the quality of those lives. In the introduction, Gawande points out the fact that as late as 1945, the majority of people died in their homes; by the 1980s, that number was just 17 percent. The subsequent shift to hospitals and nursing homes as the epicenters of care for aging patients, the challenges that have emerged for the field of geriatrics as the population lives longer and longer, and the choices that the ill and the elderly (and their loved ones) must eventually confront are the primary focuses of Being Mortal. Balancing well-crafted research with insightful windows into the human dimension, Gawande comes up with an analysis that is both thought-provoking and wonderfully written, without any of the dryness or distance that might be expected from a member of the medical profession. Illustrative stories, such as that of his grandmother-in-law, Alice, whose physical and mental decline are rendered in heartbreaking detail, comprise a large segment of the book. Hospice care is also explored as an often-overlooked but growing alternative for those with terminal conditions. 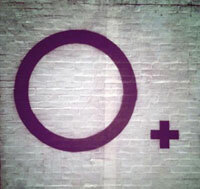 An interesting approach was launched by the insurance giant Aetna in 2004. Generally, hospice requires an agreement on the part of the patient to accept only palliative care for their illness, but Aetna allowed the pursuit of treatment options while at the same time having a hospice team to assist at home. Enrolled patients in the so-called “concurrent care” program ended up visiting the ER half as often as the control patients, use of hospitals and ICUs fell by more than two-thirds, and overall costs dropped by almost a quarter. 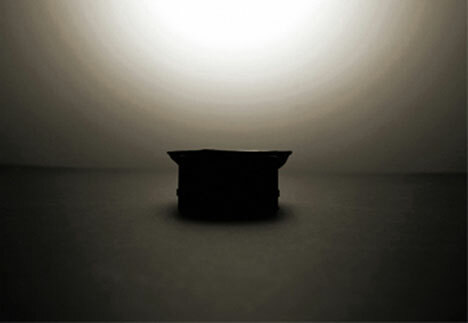 The phenomenal success of the program was stupefying. “What was going on here?” asks Gawande. “The program’s leaders had the impression that they had simply given seriously ill patients someone experienced and knowledgeable to talk to about their daily concerns. Somehow that was enough – just talking.” It’s another example that buttresses the book’s theory that simple avenues of emotional support often matter more than complicated medical interventions at the end of life. Gawande’s own experience with his father, whose illness brought the author face to face with many of the same scenarios encountered by the patients he talks about in the book, culminates in a haunting epilogue about returning his remains to his homeland of India, ashes scattered along the Ganges River. “In bringing us there, my father had helped us see that he was part of a story going back thousands of years – and so were we,” writes his son. In its own way, Being Mortal is also a powerful testament to the timeless truth of that thought.